Craighill Channel Lower Range Front Lighthouse – Chesapeake Chapter U.S.L.H.S. Craighill Channel Lower Range Light Front (Craighill Light) is the second oldest cast iron, “spark plug” and caisson type lighthouse in the United States. Its design with a single-story keeper’s quarters is unique. 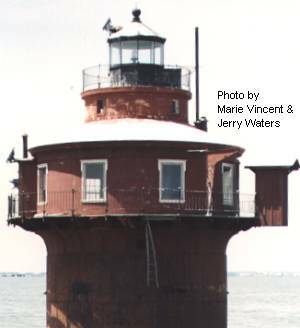 Built in 1873 it had a fourth order Fresnel lens with a red lantern. The light was automated in 1964 with a 250 mm solar powered optic. Located in the harbor entrance about 2 miles east southeast of North Point. Accessible only by boat. There is a distant view from North Point State Park. Tower closed to public. I want to become a Chapter member! © 2013-2017 Chesapeake Chapter U.S.L.H.S.